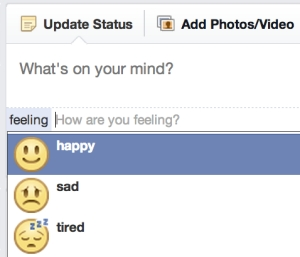 A new mood selection update has been introduced by Facebook allowing people to share how you’re feeling or what you’re doing through a drop-down menu of emoticons and media. The new feature begun testing in January but Facebook have only just released screenshots on exactly how it will work. The feature will appear in the status update box at which point you will see the new feature alongside the camera icon. The smiley face button allows you to share how you are feeling as well as what you are watching, reading, listening to, eating or drinking. A sub menu will appear of emotions, media, or nourishments. You are able to add in an extra bit of information eg the song you are listening to, the page of the band you are listening to or where you are eating. This information will also help Facebook in their new graph search feature as it allows them to find out more information about users. The update will the notify you that “the details you add to posts also appear on your about page and other places on Facebook”. In theory Facebook will then know exactly how you are feeling and therefore will be able to advertise Kleenex to you if you are sad or maybe holidays abroad if you are feeling depressed! Sharing how we feel will now become easier then exclamation points, colourful language or types in emotions. The idea of mood sharing will make it faster and includes a nice graphic to go with it. However, many people do not like/know how to share how they are feeling and will not see this as a beneficial feature. The concept of being able to easily select and share a pre-constructed emotion could make people more open to stating their emotion than normal which is exactly what Facebook are looking to achieve!